The circumstances leading up to and immediately following Stalin’s death are accurately and hilariously fictionalized in Armando Iannucci’s The Death of Stalin. 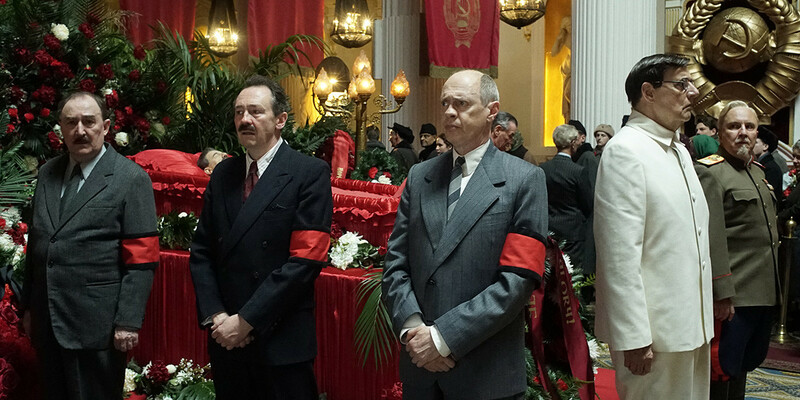 Iannucci assembles a fantastic ensemble that includes Steve Buscemi, Jason Isaacs, Paddy Considine, Jeffrey Tambor, and Michael Palin to tell The mostly true story of Khrushchev’s (played by Buscemi) rise to power. Each and every actor nails their part, which is due to their comedic timing as well as the pitch perfect script. Despite their being horrific events happening during this time, the sheer ridiculousness and ineptitude at even the highest levels of the USSR lead to some laugh out loud moments. A good example of this happens early on, when Stalin asks for a recording of an orchestra performance that wasn’t recorded. Fearing that Stalin will have him killed for this, he makes the entire orchestra play the show a second time and brings peasants in off the street to fill the audience so the acoustics sound right. It’s a goofy situation that the film gets a good laugh from, but beneath the humor there’s still the underlying fear of a tyrant who kills on a whim. Reminding me most of Dr. Strangelove in the way it skewers politics at the highest level through a comedy of errors, The Death of Stalin is The Cold War by way of The Marx Brothers. It had me laughing out loud regularly, and the fact that much of the insanity actually happened makes it even more unbelievabel somehow.